WARNING: Make sure you have the Coin Receptor plugged in and working before configuring the Coin Op, failure to do this may result in a system hanging whilst it searches for the device. Note: In order to use the Coin Acceptor you may need to install the USB to UART Bridge Convertor, which is available Here. You can purchase a Coin Acceptor by going here. For the Coin Operation you can set various attributes. If you wish to test the booth without any coins you can set the amount of credits to start with by altering the Credits Text Entry Box. Also the Photograph Price and Reprint Price can be individually set. Options on the Print Picture (should the time out expire) to allow them to try Again or to automatically just print the picture (depending on how strict you wish to be). The text next to the Display price can be altered to reflect different languages and the Font details can be altered by clicking on ‘Font’. To change the Currency of the PB Pro this needs to be done in the Windows Control Panel’s Regional Settings. 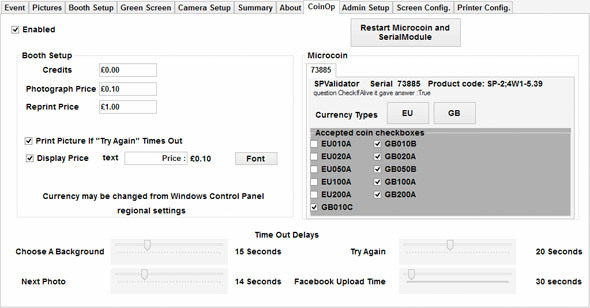 For the microcoin add-on you can set the EU or GB price and set the different coins that are allowed (clicking all the options for GB or EU allows all coins to be accepted). The Attributed Tick Boxes for the Coins are as follows, and can be turned on or off to suit (after changed these settings and clicking Save in the admin you can put a coin through the Coin Acceptor to check this).